Welcome to our kippah store! We offer a HUGE variety of kippot for ANY occasion. Alljudaica.com offers a complete and extensive selection of Kippot for all occasions. Select a category below to view our selection of Kippot. We are experts on bulk kippot orders for bar and bat mitzvot, weddings, and special occasions.We sell kippot to individuals, schools, organizations and synagogues. If there is a style which you don’t see, phone us Toll Free and we will assist you 800-626-6536. 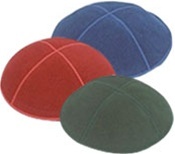 Our bulk kippot are made with the highest quality of fabric, and detail. The personalization is crisp and clear. Our personalized service is unparalleled. Our commitment is to serve you and help assure you that your selections are correct, and your personalization information is accurate. Before ordering, as explained below, please feel free to phone us Toll Free ( 800) 626 6536. We will answer any questions and help walk you through the process. Don’t worry about spelling out Hebrew names, and Hebrew months. We are experts and will complete these details, per your instructions. If you're ready to buy online, please take a moment to read through our policy. ORDER - Choose the bulk kippot you wish to order. Select your options and place your order using our secure server. EMAIL - After you place your online order, you will receive a confirmation email. This will confirm that we have received your order and include a detailed summary of your order. CONTACT - For all bulk orders, a customer service representative will call you to confirm shipping, spelling, address and other information. We have found this to be important in helping to prevent errors. Once approved by the customer, there can be no changes, returns or exchanges. Please make certain that the contact information you enter on your form is accurate. Your credit card will not be charged until we have verified your order details with you. PROCESS - Next, we process your order. Of course, we will be responsible for printing errors resulting from our own error. DELIVERY - Please allow 3-4 weeks for custom orders. When you receive your order, you must check the items within 48 hours of delivery for accuracy. For rush orders, additional shipping charges will apply. For orders placed less than 10 business days before an event, an additional surcharge will be added to the order total. If you did not check your order for accuracy within 48 hours of arrival, additional shipping or rush charges may apply.